Even as he approaches his 35th birthday, Mike Dunleavy is still enjoying popularity in the NBA, with the Chicago Bulls very interested in re-signing him, but there are also the Cleveland Cavaliers and Washington Wizards hoping to convince him to take off. 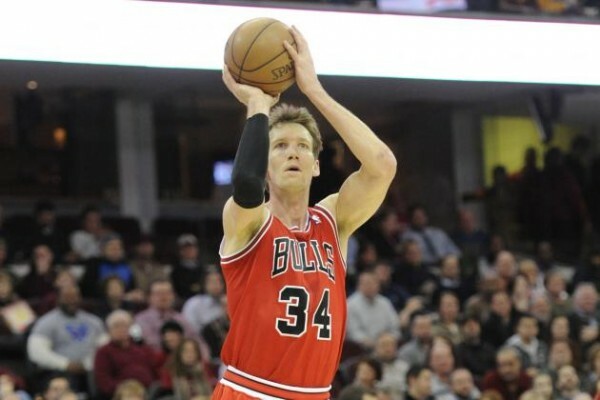 Dunleavy had two pretty good years with the Bulls after signing as a free agent in 2013. He averaged 10.5 points and 4.1 rebounds per game and shooting 39.2% from beyond the arc, which is the number everyone cares about these days. He’s also a pretty good passer and a better defender within the right team system than usually given credit for. He’s been in the league since 2002, but has been part of only four postseason trips. This season’s run to the conference semifinals was the first time in his career beyond the first round. He’s reaching that stage of becoming a veteran that’s going to occupy a small role (after mostly starting in Chicago) in order to get teams to the championship. The Cavaliers don’t need a starting small forward, but the NBA finals, regardless of the Irving and Love injuries, showed they need more. James Jones and especially Mike Miller are not an answer to the depth and talent on the Warriors or other Western teams. Dunleavy still has a lot more to give them those guys. As for the Wizards, they do still believe they can keep Paul Pierce, but he’s most likely going to end up with the Los Angeles Clippers, if they can take care of the cap situation which right now is preventing them from signing Pierce for the money he wants. If he is signed and Pierce walks, he’ll probably still start ahead of Otto Porter, but it doesn’t mean he’ll get more minutes. In Chicago, he’ll remain a starter, but probably with his minutes continuing to drop from 29.2 last season. However, in all the metrics and net rating numbers, the Bulls were significantly better when Dunleavy was on the floor. He’s declining, but not fast enough to count him out.